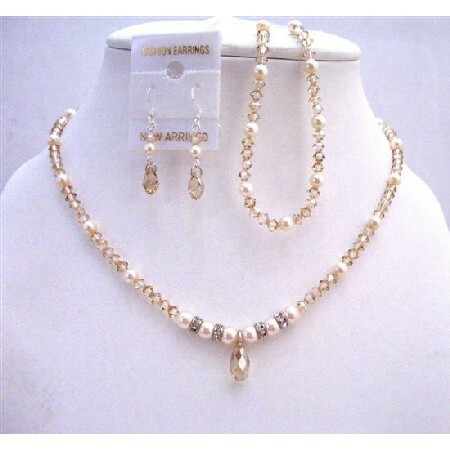 Ivory Pearls & Sparkling Of Swarovski Golden Shadow with Golden Shadow Crystals with 13mm Swarovski Top Drilled Briolettes (item # 6010) for Pendant & earrings accented in beatiful Necklace Earrings & Bracelet Bridal Jewelry Set Very Gorgeous Sophiticated Jewelry. Handcrafted Custom Jewelry are made with Swarovski Collection & latest style & upcoming designs. This is very beautiful delicate sleek & elegant Necklace Set has been hand-matched & hand strung; the Necklace Earrings is The ultimate layering piece or bold & beautiful on its own you must-have this.